Venn Chart is a helpful tool to solve math problems which requires logical thinking and deductive reasoning. 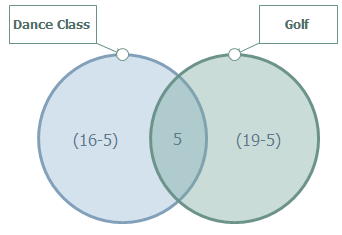 Below is a detailed explanation on how to work out math problems with venn charts. 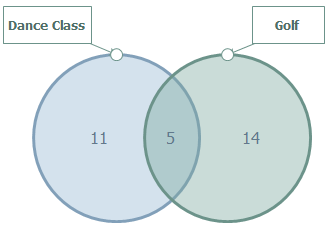 In a class, there are 7 students who are both in the band and sports team; 8 students who are not in the band or sports team; 16 students are in the bands; and 19 students are in the sports team. How many students are there in the class? 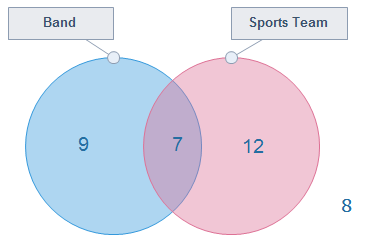 First let's draw a Venn diagram to show the numbers in the band or in the sports team. We can put in the numbers for the first two facts straight away, as seen on the left. The 7 students who attend both band and sports team go in the intersection because they need to be in both circles. The 8 students who don't belong to any group go on the outside because they shouldn't be in either circle. In a class of 50 students, 16 take Dance Class; 19 take Golf; 5 take both Dance Class and Golf. How many students in the class are not enrolled in either Dance Class or Golf? On the worksheet below are more questions for practice, click the picture to download this worksheet.